Anyone who’s tasted my homebrews lately knows I have little advice to give to California Brewers, so I just have one thing to say them: Give California Cafe in Palo Alto a call. They’ll further elevate your beer by creating a great dinner out of it. Last nights beer dinner featuring Drake’s Brewing was yet another hit in their recent series of dinners. I’ve been to other beer dinners held at California Cafe, but just haven’t written much about them. I rarely write about beer from a culinary angle since I generally don’t know what the hell I’m talking about. Of course, ignorance rarely stops most people from talking authoritatively about things and that’s not going to stop me here either. So here’s a brief recap of last night’s event. As in the usual format, California Cafe’s Executive Chef Mark Pettyjohn created a four course menu with a dessert, each course pairing with one of Drake’s Beers for about 35 of us that evening. Dow Tunis, Drake’s Sales Manager and twenty-five year veteran of the Bay Area craft brewing scene, talked about each beer, drifting around to each table over the course of the evening to chat, answer questions and hear what we all had to say about his beers. Turns out Dale used to hang out at one of my favorite watering holes on the Peninsula, Marvin Gardens, an unassuming little shack next to the train tracks in the industrial part of Belmont that always has a nifty little tap list. Anyway, back to the dinner. Since I saw Peter Estaniel of the BetterBeerBlog across the room furiously scribbling down notes and taking a bunch of pictures with his phone, it’s a good bet a full deconstruction and in-depth analysis of the evening on his blog is imminent, so if you want to get the culinary low-down from someone who actually knows what he’s talking about, check out his blog. 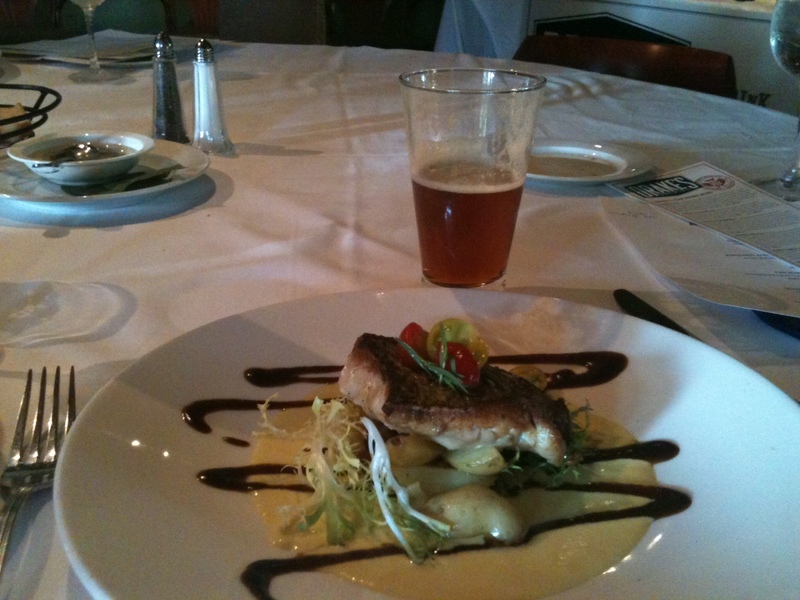 I’ll just rave a little about the lively course of Pan Seared Alaskan Cod, pancetta and fingerling potato ragout, and a sweet corn-port sauce served with the unlikely pairing of Drake’s super intense Denogginizer Double IPA. I expected the Double IPA to totally blow away a light fish like cod. Somehow, that didn’t happen. Instead, the sweetness from creamy corn-port sauce, the saltiness from the pancetta, and the hoppy bitterness from the Denogginizer all were highlighted by the mildness of the cod, creating an energetic mix where each bite tasted differently and all the different flavors found a way to get along. The following course took a completely opposite approach. 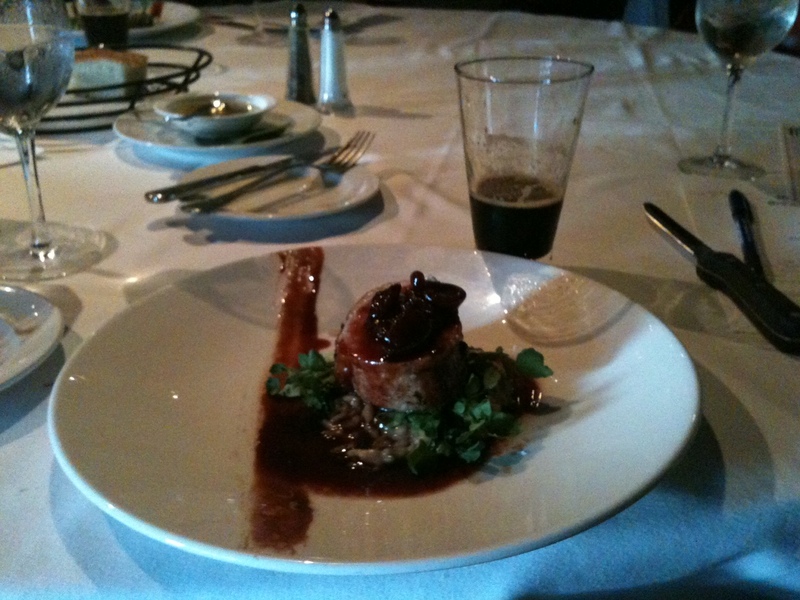 A House Cured and Smoked Pork Loin with coffee risotto and spiced cherry sauce was full of smokey, earthy flavors, and blended seamlessly with the roasty coffee flavors of Drake’s Drakonic Imperial Stout. What a great warm and cozy course this turned out to be. True to the name of California Cafe, only breweries from California are celebrated in this dinner series. Next up is 21st Amendment on August 25th. I’ll see you there.